William Grimes’s front-page piece in Sunday’s New York Times pinpoints one of the great tragedies of our times. In a famous lab trial, a chimp named Sultan put two interlocking sticks together and pulled down an elusive prize, a bunch of bananas hanging just out of arm’s reach. Nearly a century later, eager tourists have conducted their own version of the experiment. Equipped with the camera extender known as a selfie stick, occasionally referred to as “the wand of narcissism,” they can now reach for flattering CinemaScope selfies wherever they go. Really, (young) people: Is it such a hardship to just look at the artwork? But we don’t give a damn about the selfieniks, despite what the concern expressed in the Times piece. 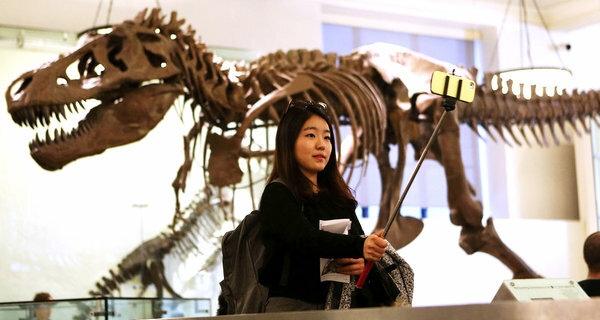 Unfortunately, other museums are more selfie-centered. Generally, the taking of selfies is not merely tolerated, it is encouraged. Art museums long ago concluded that selfies help visitors bond to art and create free advertising for the museum. When Katy Perry dropped by the Art Institute of Chicago’s Magritte exhibition last summer and detoured to take a selfie in front of Grant Wood’s “American Gothic,” the museum reaped a publicity windfall after the image was posted on Pinterest. The Whitney Museum of American Art, at its Jeff Koons retrospective last year, passed out cards proclaiming, in capital letters, “Koons Is Great for Selfies!“ and urged visitors to post their work on Instagram. Granted, Koons Is Great for Selfies! is great for an epitaph. But not so much for museums. This entry was posted in Uncategorized and tagged American Gothic, Art Institute of Chicago, Grant Woods, Hirshhorn Museum and Sculpture Garden, Jeff Koons, Katy Perry, Koons Is Great for Selfies!, Magritte, Metropolitan Museum of Art, New York Times, selfie sticks, Sree Sreenivasan, Temple of Dendur, Whitney Museum of American Art, William Grimes. Bookmark the permalink. 1 Response to Ban the Museum Selfie Shtick! Ah…the self-possessed of today are reverting to man’s primal instincts.